34 X 18, this is the the gear ratio I'm running on my SS. Last Sunday, this gear ratio worked great going up Burbank, but today this was NOT the case. Today 34 X 18 represented pain. 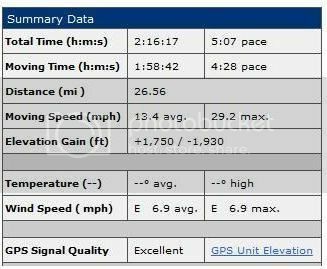 34 X 18 hurt and drained all my energy on this Saturday mountain bike ride. I left my house at around 11:30 am for a mountain bike ride up Marshal Canyon. Still enjoying the idea of my SS, I was eagerly headed towards the mountains. Would this ride be as challenging and fun as Burbank? From Oak Mesa Elementary School, I dropped into lower Marshal Canyon. Lower MC is relatively easy with multiple stream crossings, nice shaded tree canopies and the climb is mostly progressive with a few short sprint climbs until you get to Marshal Canyon Equestrian Center. Knowing this, I decided to slow my pace and not overexert myself. My strategy was slow and steady for lower MC and conserve as much energy for upper MC. The ride up lower MC went as planned. Actually, it was pretty darn easy and by the time I got to MC Equestrian Center, I felt good. I took a small break at the equestrian center before heading up. From the equestrian center, I took the double track to the left. This is a shorter distance to what I call the "Plateau", a level clearing on upper MC but definitely not the top or end of MC trail. After the Plateau things started to change, I got tired, weak and overall my energy level dropped! BONK! The next half mile was hard and I felt my power drop and by the time I rode past the "Logs" I was wasted. At this point, I dismounted my bike and thought about turning back and heading down MC. I rested a few seconds and decided to push my bike up for a few feet. I did just that and hopped back on the bike. One revolution, two, three and four. Damn, 34 X 18 is painful. Each progressive revolution was strained and I had to dismount again. The Three Witches (A climb up Marshal Canyon and its actually called something else that rhythms with "Witches" but I'm being nice) with a gear ratio of 34 X 18 was harsh. By this part of the trail, I was WAY past tired and borderline delirious. Even walking my bike up was a strain but I kept going. I could have turned back at anytime, but I decided I rather push my bike up MC than turn around. "Ahhh Yellow Gate!" I made it. From Yellow Gate, I headed south to Burbank to finished my ride. Down Burbank, I stopped half way and headed back up for about 1/8 of a mile before heading down to were Burbank and Cobal meet. I headed up Cobal for about another 1/8 of a mile and decided I needed to turn around and go home. 34 X 18 is too tall a gear ratio for me to turn. I just ordered a 19t and hopefully this will be easier to push. 34 X 19 will be closer to my desired ratio of 32 X 18. Unfortunately, the crank set I own calls for 110 bcd which a 32 t chainring non-existent. 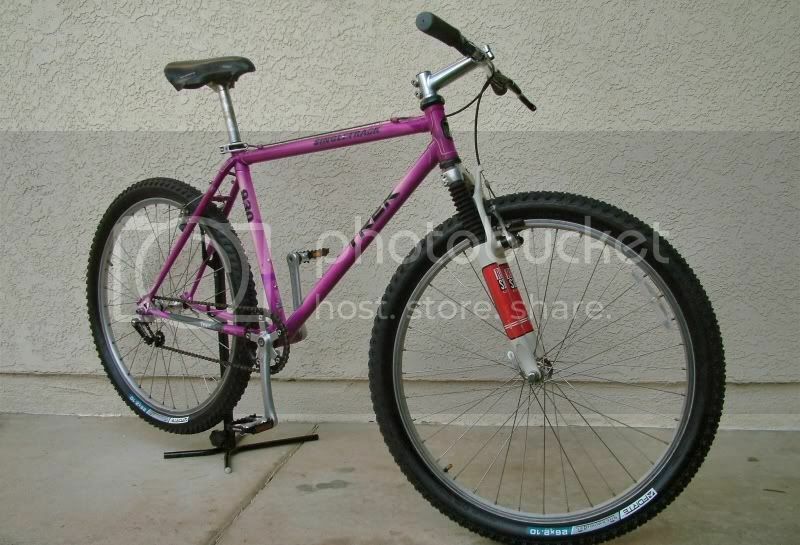 Beth, a Co-Worker wanted me to get her old Trek 920 in working order so she could start riding to work. Working with a very small budget, I decided to ditch the 7 speeds and convert the Trek to a SS. This was my first conversion and it was surprisingly easy. I was able to re-use most of the original parts and only replaced tubes, tires, and cables. I got Beth's bike in working order and in the process grew fond of the notion of building myself a SS. Lucky me, Beth's ambitions of riding to work did not pan out and the bike was given to me for a very small fee. I decided to strip it down, powder coat it and rebuild it. The result, a very stealthy SS. I stripped the bike down and powder coated the frame, handle bars and crank arms. I am very happy with the results and the cost to powder coat was close to free (It helps when you know a Powder Coater). Brakes and Levers: I replaced the old, ugly brake/shifter levers to Avid Single Digits and added Avid V-Brakes to match. This Avid Brake Lever/Brake combo works well with more than adequate stopping power. Chain Ring: I opted for a Surly 34 tooth ring. Stem: The OEM stem was about 130 mm and 20 mm too long. It too was ugly, so I replaced it with a 110 mm Easton EA 30. Fork: I replaced the old Rock Shox Indy XC for a traditional rigid fork. 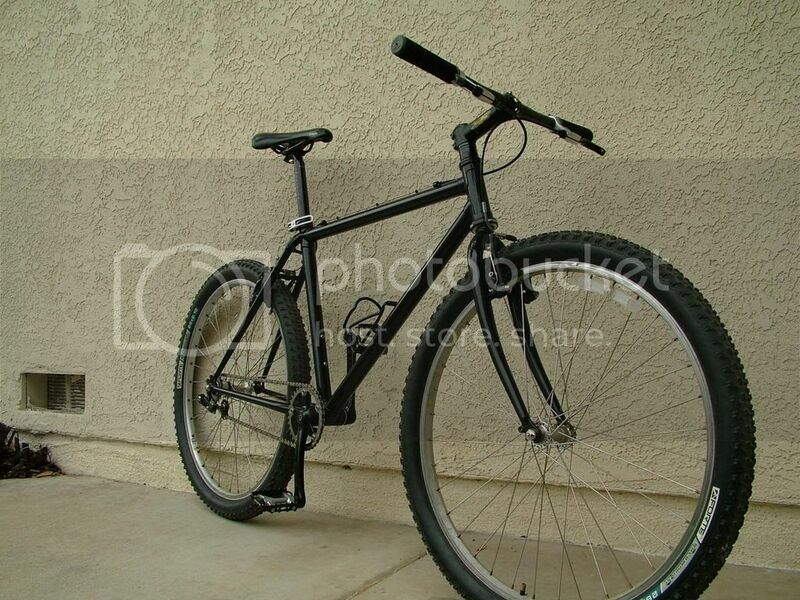 I went this route because; 1) Its simple and 2) New Generation suspension forks would mess up the original geometry of the bike. First Ride: I took it out to Mills and Baldy Road last Sunday and I was surprised how well it rode. Riding up Burbank was challenging but I managed to get to the top in about 30 minutes. There were sections up Burbank I had to really mash gears to keep moving forward. The ride down Cobal was fun. The rigid forks did make it a harsh ride downhill but again it didn't seem to bother me much on the ride. I guess I'm still in the honeymoon stage of SS riding.